I can never get tired of saying that music is inspiration, music is therapy and music is a big part of our lives. We don’t realize how much of an impact it has on us and our culture. Music is a part of us from a very early age if we think about it. Parents sing to their children when they are still in the womb, we learn the alphabet through songs and I even remember when I started learning a new language as a child, songs would play a big part of that journey too. And how do we celebrate? With music! At a wedding, birthday celebration, a party, a baseball game, think about Christmas, you cannot walk into any store now without hearing a festive tune. Music brings people together in a way not many other activities can. Whether it’s a small jam session at a park, a street performer or a concert at Wembley Stadium, people come together to celebrate the way music makes them feel. This month I talk to the talented Jenna Jones. A performer, writer and visual artist. Jenna Jones is a violinist, (she prefers the description fiddler as it somehow fits better) singer/songwriter and lover of the visual arts/movement and dance in general. I was born in London, second generation Irish. I grew up with music around me, having musician parents. I was very fortunate to have the opportunity to join bands and do gigs from a very young age. I have consequently done most of my learning on the scene, with an audience in front of me. I never fitted in in the school orchestra, I don’t like sitting and playing very much, and I don’t work remarkably well with full on instruction. Playing as a young teenager with professional adult musicians sped up my learning process ten fold, and this is where I grew and really learnt. I was in no way good enough to play in front of an audience, often big ones, and I was underaged to top, but my dad saw it as an invaluable experience. It was really a musical education you couldn’t pay for or put a value on of which, I’m eternally grateful to my dad for. I learnt how to freestyle basically, how to think on my feet, to not be thrown by changing circumstances etc. It’s allowed me to think/play in the moment, I don’t rely on sheet music or instruction. In fact, I prefer creative freedom….and winging it. I learnt how to weave in and out of all genres of music in a way, learning to forge my own style, within a group, so also understanding the crucial roles of all members collectively. My dad (Pete Bite) is a singer/ songwriter, who had numerous big record deals and was signed by Mickey Most in the 80’s. I picked up on that side of creativity and expression from a young age too, so it wasn’t solely about being on stage. The idea of translating your own story into song was something that resonated with me. The ‘art’ being found in the ability to be truthful, honest, raw, in your ‘own’ way. There is no real right or wrong, as it’s an individual expression, a release. The process of release I think was of particular importance. I’ve observed more the ‘need’ to write over recent years, as a form of therapy, music can be quite transformative. I was a very shy kid and the appeal to use performance to express yourself fascinated me from the moment I made the connection that feelings could somehow be transformed into ‘art’ or something else. Although I do get nervous and always have, I find that being on stage feels like a more authentic way of living sometimes, it’s the place where there is freedom, no rules (within reason) and a platform to kinda be whoever you want to be, or feel you are etc. It’s a safe place to express and transform in a way. Over the past few years in particular I’ve become more and more taken by the idea of transformation and change and healing in a way. I’m kinda concluding that that can all be done through art of any kind. For me it’s predominantly music, however it does crossover for me personally on a visual sense too. With my love and interest in dance and fashion….and what the eye sees, as a whole. I love visuals, my mind is very visual, so I can imagine a song with the aesthetics and colour scheme to accompany. I see how crucial all aspects can be, to hit all the senses. What an amazing background. So Jenna, why the violin/fiddle? The truth…I saw a cool cowgirl at a Butlins holiday park, playing the fiddle in a saloon bar. She had hair down to her feet and I was purely captivated by her otherworldliness and mystic. As a child, I wanted that. It didn’t matter if it was a recorder or a violin. However I’m still very insistent that the instrument to some degree is irrelevant. I chose the violin. It could have been the saxophone. I’m not entirely sure the difference it would have made (musically speaking). To me it was and still is just a choice of ‘tool’. And I like to think I have a few options, although perhaps not all are as sharp 😉 it’s a tool of choice to channel what’s inside you I guess. Could have been a didgeridoo! Maybe the violin chose me. Ha. Who knows. What’s the appeal with performing? For me personally, being in bands is the best thing ever! Getting on stage and creating and sharing an energy with other musicians can be quite intimate and magical. I love performing in general. But being in a band and sharing high moments on stage …it’s a union of sorts, it’s kinda intimate and public at the same time. We are sharing something together and then translating it to an audience. However the feelings we get are kinda just for us. It’s a great natural high 🙂 I don’t necessarily feel that with every single band I’ve played with, I think it does require all members to be ‘in the zone’ so to speak, then in that flow, the magic can happen! I love this answer, as not many understand this concept. It’s not always about being the lead, it is the combination of each band member that creates that beautiful magic and energy. Tell us about some of your journey so far. After playing in my dads band for many years, I eventually started making musician friends and joining various north London Camden/ Holloway bands playing original music. The fact I was stronger on the improvisation front I think sometimes made me an attractive addition to a band, and also on a level footing with the ‘boys’. It shouldn’t be like that, but to some degree a certain amount of sexism still exists in music as a whole and particularly in bands. Some girls being hired mainly to look nice on stage opposed to what she can bring. Quite soon into joining bands I knew I had to have an equal take in what I was contributing musically, and luckily I always did. Over the years I’ve played in varying bands supporting great acts or have done sessions for various artists, like Gary Barlow, Take That, The specials, Florence and the machine, Bastille, most recently doing a West End residency and European tour with Michael Flatley in Lord of the Dance and just finishing a UK tour with Beans on Toast. It was an unbelievable experience, that happened quite spontaneously and unexpectedly. I auditioned for Michael Flatley a week before the show went live at The dominion theatre for his final West End residency. It was by far the biggest audiences I had performed to, with such a dedicated and global fan base. I loved the routine of being a West End performer, with our own dressing room that became like a second home, and the feeling of being part of something quite iconic was a real privilege. After a 6 month residency we went on to do a European tour, of 13 countries, 50 odd cities over a period of months. Travel being part of a musicians job is undoubtedly a positive aspect for me. Exploring cities I previously hadn’t realised existed. You are part of history for sure Jenna, as Lord of The Dance like you said, has a global fan base and will always be a very loved show. And your recent tour, how was that? Touring with Beans On Toast was great. Jay has established himself a strong and dedicated fan base over years of hard work on the music/festival scene. I actually watched him from the beginning, so again, a nice privilege to then join his band for the Custy Tour. What do you prefer? Recording or touring/performing? I used to hate recording. I saw it as a quite intense and intimidating process. It requires you to be naked in a way, strip back and work forwards. Where as performing is slightly different to that. More of the illusion is required all at once. I’ve now grown to love all aspects if I’m honest, for varying reasons. I like the idea of watching something grow from nothing in the studio, from paper to then hearing it through speakers. What’s currently on the agenda/ what direction are you headed in? More Jenna Jones work, the big picture of ultimately being on a platform to join all my passions together and express it in musical form! I’m writing and recording more of my own stuff now, working with various producers, choreographers, and creatives in general. My visual identify is growing, and my own input in how I translate my inner world is imperative! So in a way I’m creating my visions through a variety of mediums these days, and exploring the art of expression in both the visual and the audio. I think I always knew the intention was never to be solely a musician in someone else’s band, as I’ve grown, I’ve realised I need to have a large amount of the control in what I do, mainly because I see it in my mind, so inevitably I need to get it out there! Aside from music/dance/visual projects any other dreams ? To write a book, or numerous books. I read a lot, and I’m captivated daily by the beauty of words, and the ability they have to transport us to other worlds and dimensions, or to make us think, on a really basic level. I think at some point I’d like to write a semi biography, self reflection, spiritual book, I have an ever growing interest in the healing and spiritual capacities of art, the connection of all things and beings :)!!. oh, and to learn to fully ride rodeo style and own my own white horse, or a whole ranch. Amazing Jenna, great answer as I always tell people to write a book! If you are passionate about something, if you have acquired the right knowledge and skills, there is always a book to share all the experiences in. People who take risks, the game changers, risk takers and outlaws of society, I adore an individual character. Films, certain directors with strong visual identities like Wes Anderson, Quinton Tarantino. And mainly, People I love, they bring out all the feelings I somehow want to transform into art, good and bad. Mainly my mum, she’s the epitome of a strong independent woman. She’s taught me how to live, basically. What does Jenna enjoy doing on her spare time? Photography, I’m an avid street photographer, I love capturing real life in its full messy glory. I read a lot. Tom robbins and Murakami are favourites and many many books on Buddhism. I’m also doing an online course on quantum physics. Which I’ve had a fascination with for many years now. When you are young your imagination is vast and free. As soon as you’re able to write, capture all you think on paper. It’s magic! Oh and start yoga from a young age. I can’t swim. I think I’m part mermaid. But I’m still learning to swim. That’s hard. Everywhere really! Vietnam and San Francisco are top of list. Ha, I’d like to think I’m practicing non attachment to items. Everything is semi replaceable. Apart from my car. It’s a vintage classic figaro, and she has an aura. She genuinely makes people happy. I love how your car is a she! Thank you very much Jenna for your time. 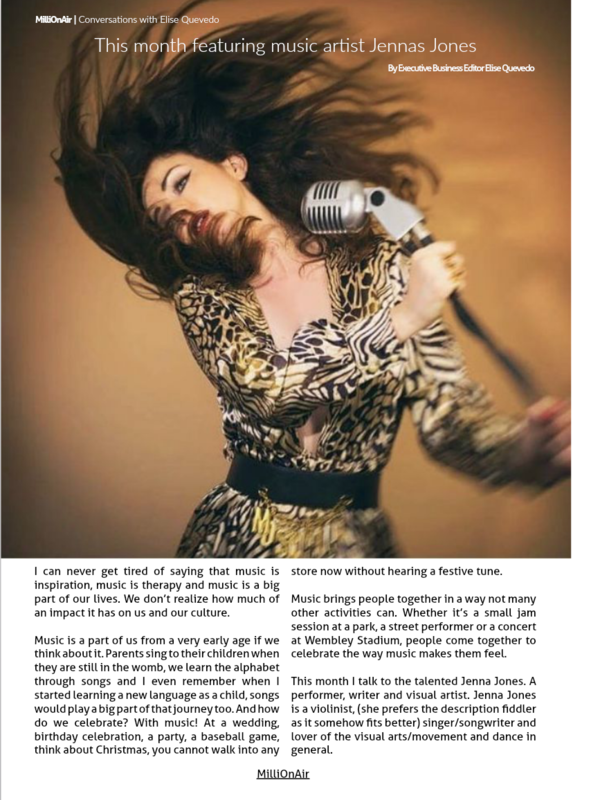 There you have it, an insight into the world of performer, writer and visual artist Jenna Jones.